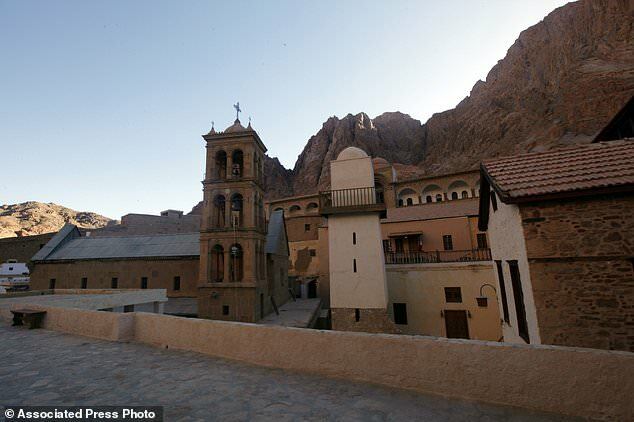 St. Catherine Monastery in South Sinai is the second largest library in the world and holds a hand-written copy of the New Testament. The sixth century church holds thousands of ancient books and scrolls that date back over 700 years. The UNESCO World Heritage Site in South Sinai was opened recently with a ceremony attended by officials from Egypt and beyond. 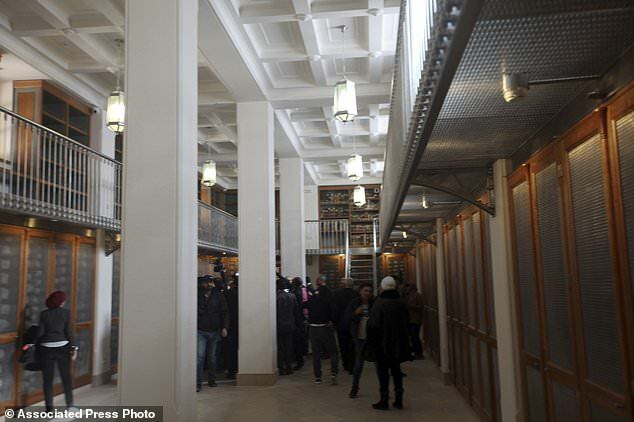 The east side of the library, which has been under renovation recently, houses the world's second largest collection of early codices and manuscripts, outnumbered only by the Vatican Library, according to Monk Damyanos, the monastery's archbishop. 'The library is now open to the public and scholars,' said Tony Kazamias, an adviser to the archbishop, adding that restoration work is still underway without specifying a completion date. The monastery contains works in a variety of languages (Greek, Arabic, Syriac, Georgian and Slavonic) which contain centuries old scripture, most of which are Christianity based. Contained within are long-lost hidden recipes from the 'father of modern medicine' Hippocrates. 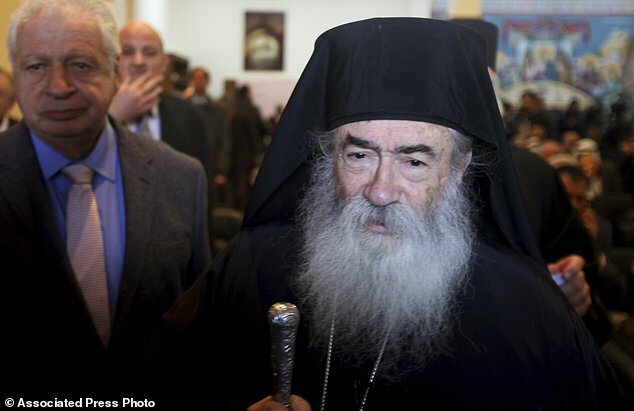 'The most valuable manuscript in the library is the Codex Sinaiticus, (which) dates back to the fourth century,' said the Reverend Justin, an American monk working as the monastery's librarian. 'This is the most precious manuscript in the world,' referring to the ancient, handwritten copy of the New Testament. It houses the world's second largest collection of early codices and manuscripts, outnumbered only by the Vatican Library. It contains the Codex Sinaiticus, an ancient handwritten version of the New Testament which is 'the most precious manuscript in the world'. St. Catherine's is an area revered by followers of the Abrahamic faiths, Judaism, Christianity and Islam. The library also held some ancient paintings which are currently on display in the monastery's museum. 'There are beautiful paintings in the manuscripts. When you turn the (pages) there is a flash of gold and colours. It is a living work of art,' said Reverend Justin. 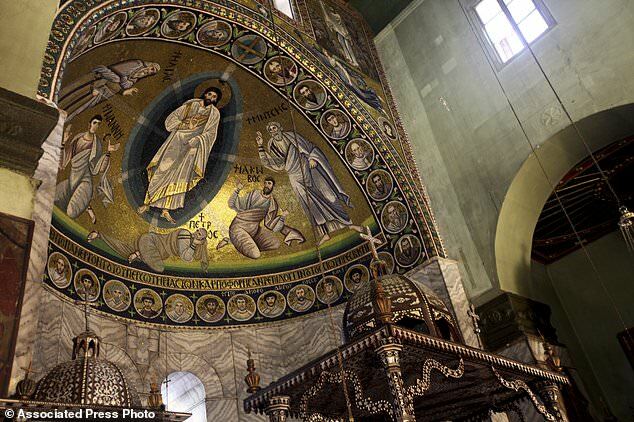 As well as the reopening of the ancient library, the officials also inaugurated the Mosaic of the Transfiguration. Housed in the in the eastern apse of the monastery's great basilica, the mosaic covers nearly 500 square feet (46 square metres). Made from a combination of glass paste, glass, stone, gold and silver tesserae the work of art can now be seen by the public. Jesus Christ is depicted in its centre between the prophets Elias and Moses. The 6th century mosaic was created at the behest of the Byzantine Emperor Justinian, who also requested building the monastery. St. Catherine's, where the monastery is located, is an area revered by followers of the Abrahamic faiths, Judaism, Christianity and Islam. Like the Old City of Jerusalem, it has become a popular destination and an attraction not only for pilgrims but also tourists from the world over. Hippocrates was born in 460 BC on the Greek island of Cos. The Greek physician lived during Greece’s Classical period and is traditionally regarded as the father of medicine. About 60 medical writings have survived that bear his name – although most of these were not written by him. He has been revered for his ethical standards in medical practice, mainly for the Hippocratic Oath – which is still practised by doctors today. The 6th century monastery is home to a small number of monks who observe prayers and daily rituals unchanged for centuries. Its well-preserved walls and buildings are of great significance to the studies Byzantine architecture. It's situated at the foot of Mount Sinai, also known as Jebel Musa or Mount Horeb, where Moses is said to have received the Ten Commandments. Earlier this year, ancient works hidden underneath monastery scriptures were uncovered using imaging technology that pieced together words originally scrubbed off. 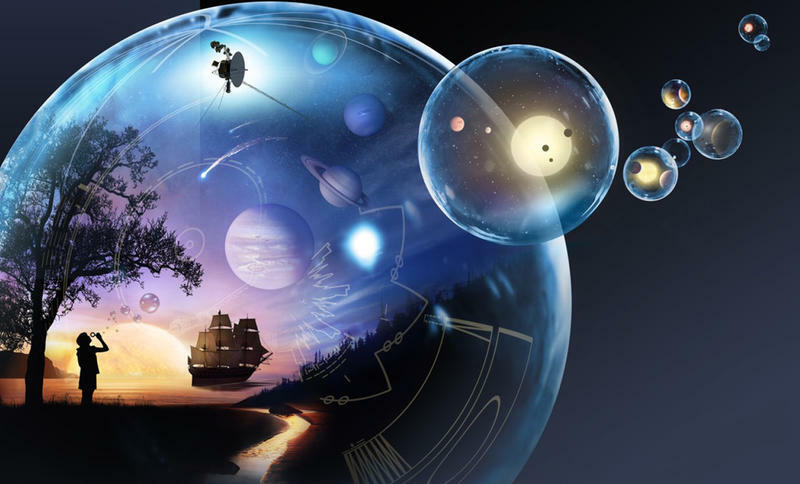 They found a series of lost texts using a method that allows scientists to restore ancient documents that were written over long ago to save on expensive parchment. 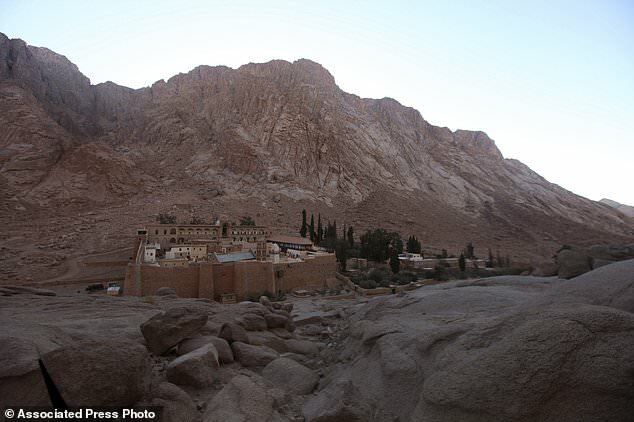 The discoveries at Saint Catherine's monastery signalled a 'new golden age of discovery', the scientists behind the research said. Parchment was once extremely valuable, meaning it was often reused. Monks commonly wrote copies of the Bible on top of old texts, meaning many ancient texts have been lost.